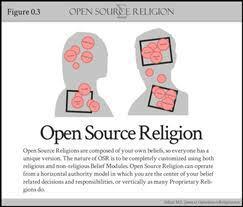 For this essay I will explore the rationale for an offshoot of the Open-Source paradigm known as Open-Source Religion. I will also refer to it loosely and interchangeably as Open-Source Philosophy. 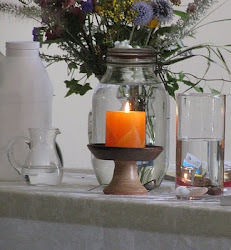 Open-Source Religion can be summed up as the individualized practice of mixing various religious teachings with a diversity of non-religious ideas and beliefs to form a coherent spiritual framework for oneself. A person is free to be as creative as they so choose in this process, as long as their beliefs do not violate the golden rule: do no harm. For example, if you believe that a three-eyed race of telepaths from the Sirius star-system seeded the earth with intelligence, and at the same time believe in the philosophical teachings of both Jesus and Buddha, then more power to you. Theoretically your conclusions can be grounded in nothing more than pure intuition, but I believe decisions are best arrived at through critically-minded research and employing the scientific method. The danger in relying strictly on intuition is that you may end up adopting some type of intellectually-bankrupt and exploitative alternative such as Scientology. The choice however is yours. In contrast to Open-Source, traditional, proprietary religious practice insists on rigidity, standardization, and the collective deferment of authority to an elite priesthood. Open-Source Religion integrates horizontally and promotes integrity by stressing thoughtful analysis; Closed-System Religion integrates vertically and promotes a lack of integrity by propagating dogmatic adherence. The bureaucratized and hierarchical Religions of the present day eat away at the social fabric and sunder the inherent interconnectedness of humanity. I’m not saying there are no good people trapped within these systems, or that localized religious institutions cannot serve as community-touchstones; there are, and they can. But the reality is that mainstream religious ideology operates by and large as a rationale for war, genocide, poverty, and general divisiveness in the world. For all practical purposes, MSR single-handedly embedded the imagined threat of an external other into popular consciousness; a satanic boogey-man that we must unite against no matter the cost. We have seen this mentality play out in the twentieth-century during WWII and Vietnam respectively during which the American public was easily frightened into blind acquiescence, and brainwashed American soldiers proudly mailed back the bones of dehumanized enemies to their families and wore their victims’ body parts as trophies. We see this continuing today in the contrived War on Terror, as we condone and commit war-crime after war-crime, all in the name of chasing our own shadow. On top of this, MSR(main stream religion) also perpetuates the cultural epidemic of sadomasochistic addiction to self-hatred. The self-loathing person can never self-actualize, and the writhing emptiness within can only be satiated by self-destructive behavior such as mindless consumerism, or the demented urge to exert power and control over others. Moving beyond these stark issues, I see value in discussing OSR because I feel that all human beings, on a very deep level, require a self-inspired, logical, and optimistic philosophical framework for life that helps them transcend their familiar five-sense reality. To quote Logicist author David Jack, “I believe that everybody, in a sense, has a God. We [all] have something that we believe in as supreme.” I agree wholeheartedly, and believe this concept extends to all people, even agnostics and atheists. 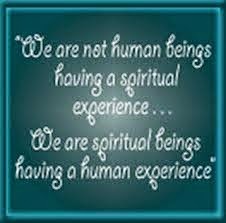 Guiding principles are in essence a Religion; just as Religion in essence is a set of guiding principles. Therefore, whether we admit it or not, we are all religious creatures at heart. In that respect, we all have a stake in the development of the OSR paradigm. I myself was baptized, raised, and confirmed as a Roman-Catholic. In time I got over the trauma of it. I studied hard, I meditated, and in the process discovered a holistic philosophy that helps me stay balanced, focused, and answer that all important question: What is life all about? You can do the same if you are courageous enough to ditch your psychological baggage, leave your ego at the door, and move forward with integrity and an open-heart. I will likely take time in a future video to outline my own personal belief system for those who are interested. Obviously the world, and the human race, is in turmoil. That is not a valid excuse to indulge in narrow-minded cynicism. If you find yourself unable to muster up a sense of optimism and elevate your thinking beyond your own ego-driven existence, it is my opinion that you are ignorant of certain fundamental truths. Something is logically amiss in your approach to problem-solving. Put plainly, you are lacking in awareness, and that is a byproduct of both conditioning and intellectual laziness. To change this, you must make the choice to engage in honest interdisciplinary research. By integrating up-to-date findings from a broad spectrum of scientific and metaphysical fields of study, you would arrive at some very liberating and encouraging conclusions. For example, systems theory, non-linear thermodynamics, shamanism, quantum physics, astral-theology, entheogenic pharmacology, and naturalistic philosophy are all critically important subjects. Yet how many of us know even the slightest bit about them, let alone how to organize them into a coherent framework? This epitomizes the challenge at hand; a challenge that nobody can undertake for you. Almost all classical belief systems are irreconcilably flawed, as has been historically demonstrated by the countless contradictions and inaccuracies they have given rise to. Consequently, none of them deserve our full allegiance. To borrow a quote from Ayn Rand, “Contradictions do not exist. Whenever you think you are facing a contradiction, check your premises. You will find that one of them is wrong.” In my opinion these belief systems had their chance, and failed to deliver. Open-Source sense making is the future starting now. We already exist in an era of Open-Source Religion. All we have to do is come to terms with it. The truth is that everyone, even those who consider themselves strict orthodox, selectively constructs their own constellation of beliefs. If this was not true, supposedly strict adherents of the Christian Bible for example would all be stoning their disobedient children to death, and condemning themselves and others to hell for wearing clothing made of two different fabrics. So obviously people everywhere are already engaged in Open-Source spiritual sense-making. But they are too proud, too ignorant, or too afraid to take off their masks and jump ship from their sinking institutions. John Maguire was born in 1985 and raised in Upstate New York. He attained his undergraduate degree in History Education from the State University of Brockport in 2007. Disillusioned, he successfully dropped out of graduate school in 2009 to pursue a happier and more authentic life. Slowly at first, he initiated a program of autodidactic learning and self-exploration that has been ongoing since. Believing truth and authenticity are the only things worth pursuing, most of his days revolve around such aims. When necessary, he pays for the ego-driven demands of life by way of substitute teaching and coaching poker. He currently lives in North Carolina with his ever-patient girlfriend Nikohl."